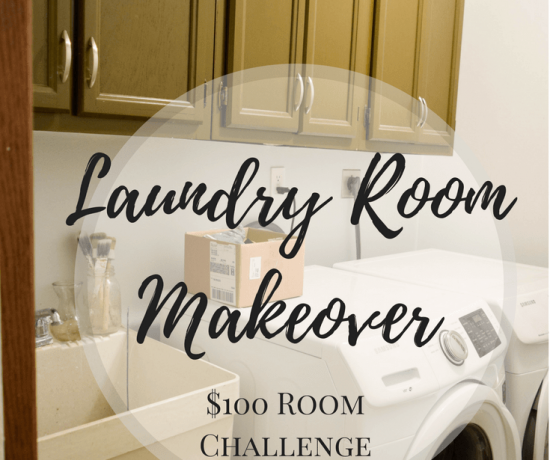 Welcome to my kitchen makeover series for the One Room Challenge! 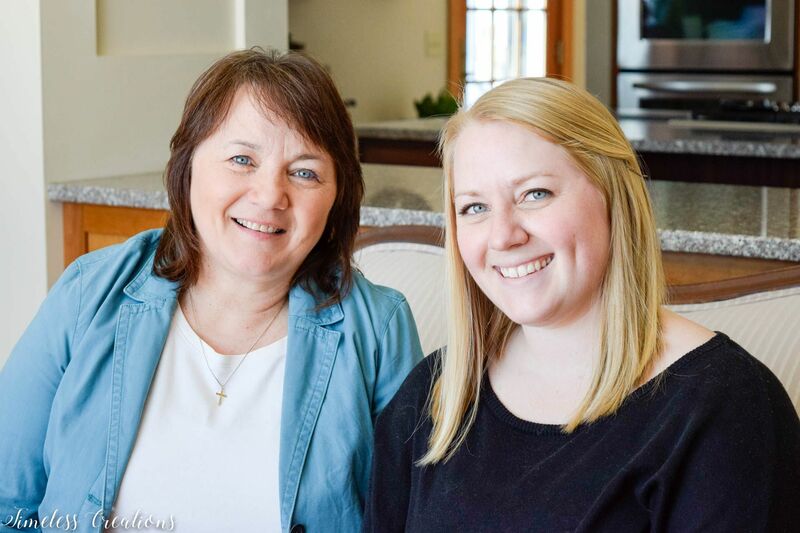 For the month of April we will be sharing our makeover journey along with all the other challengers who link up with Linda from Calling it Home Blog. We get 6 weeks to completely renovate or makeover one room in our homes. 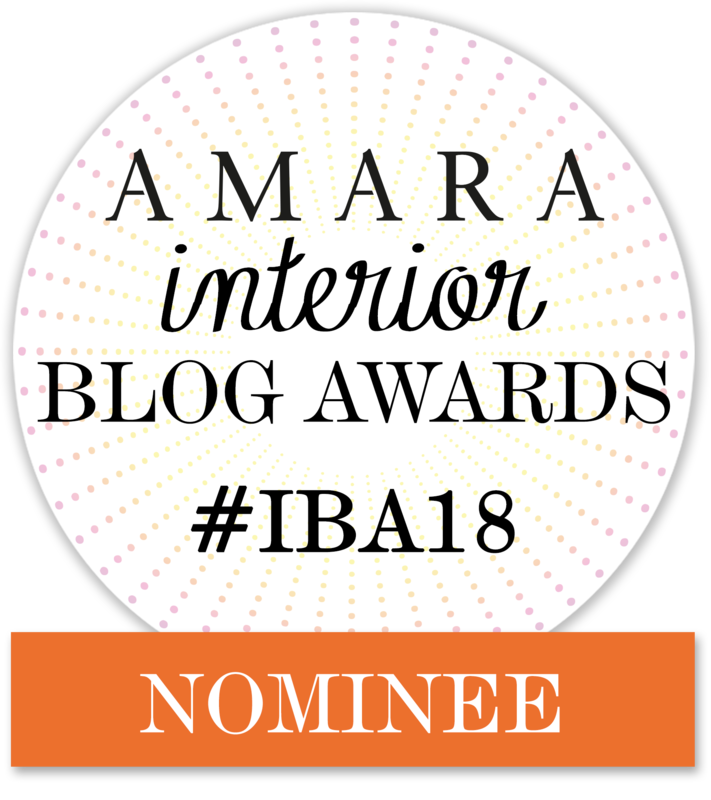 Don’t forget to see them all for even more inspiration! As some of my readers may know, my husband and I just bought our first home this last February. For those who are newly visiting, thanks for stopping by! Our new house is located in a tiny town in Minnesota, but is much closer to family; which was a necessity with our baby girl coming in June. 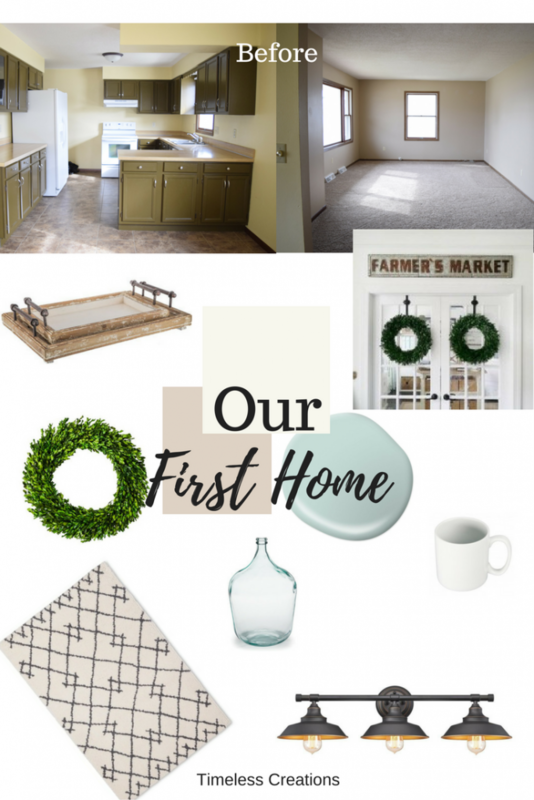 It is a cute little ranch and perfect for our starter home! This post contains affiliate links for your convenience in locating products we love. For our full disclosure go here. Here is the “before” of our little kitchen. We snapped pictures of the entire house before moving in. Just like with any home there are definitely updates we wanted to accomplish to make it ours. We decided not to move our furniture and belongings right after closing since we still had our rental for a couple weeks. Instead, the first week-and-a-half was spent painting almost every wall surface in the entire upstairs. Then we had to make a plan for the kitchen. Whew, what a list! I have been thinking of different options for all of our spaces ever since we looked at it back in December. 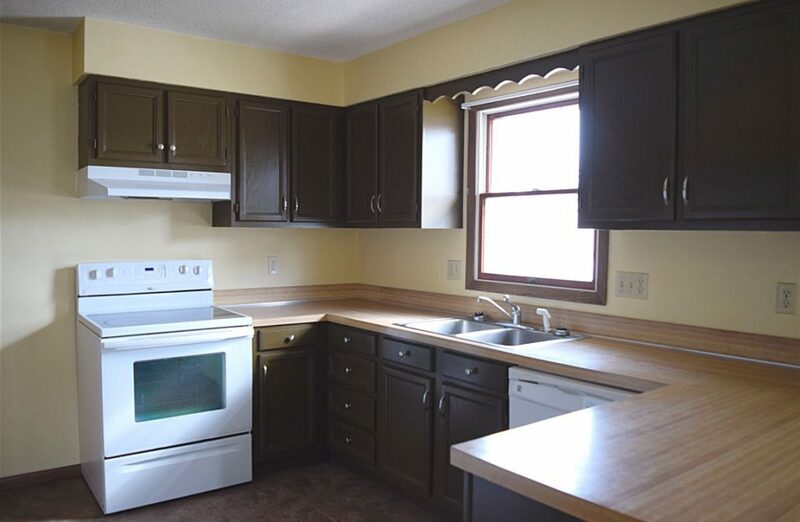 Ideally it would be nice to update the countertop and install a backsplash, but with purchasing the house and a new baby on the way those items will have to wait until our budget can accommodate them. 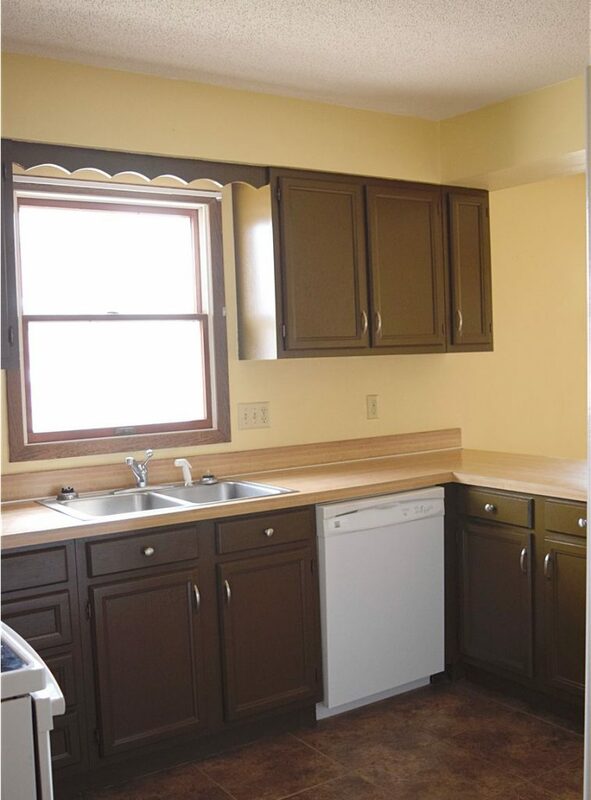 We feel that just by updating the cabinet and wall color will make a huge difference in the overall feel of this room. 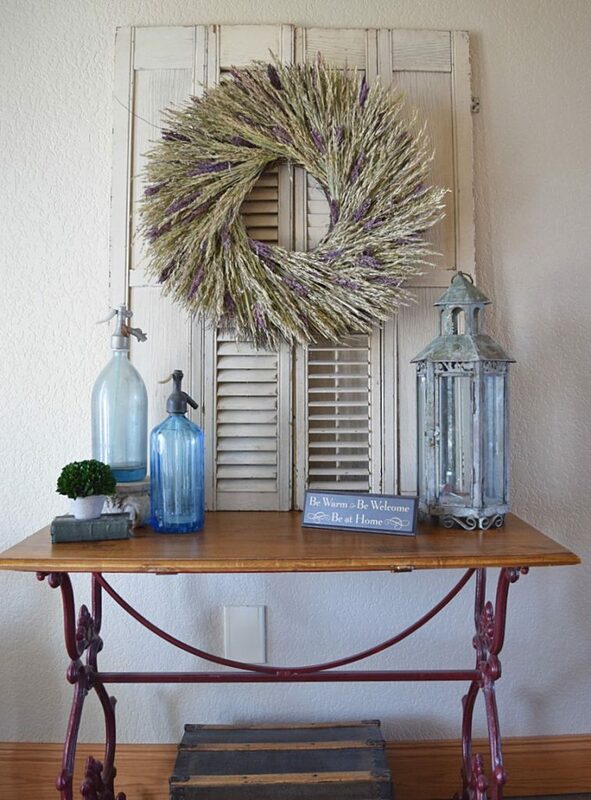 Also, since I am an avid “Fixer Upper” fan, I have definitely adapted the “Farmhouse” style of decor in my house. Needless to say, that is the look I will be going for when decorating! Below is a peek of my mood board, for my decorating inspirations in the kitchen. 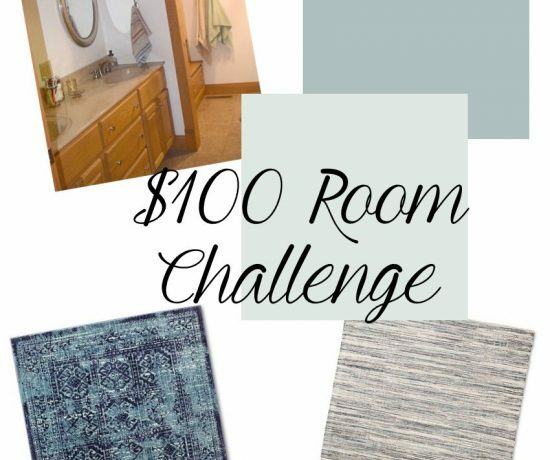 We hope you follow along with our kitchen makeover for this One Room Challenge series! 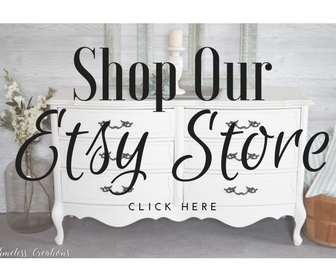 We will have a weekly post of updates, or a DIY project so stick with us to see the final reveal! Don’t miss any updates! Sign up below for our Free Newsletter. Loving your design board for this makeover! Can’t wait to see it come to life! Good luck, and have fun! Thank you so much Iris! Lots of work, but totally worth it! I actually prefer this style and set up of kitchen to the more modern totally open concept my home has. Looking very forward to seeing what you do with it!! It’s going to be beautiful! 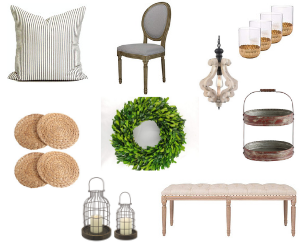 I’m actually watching Fixer Upper as I look through a bunch of ORC mood boards so I’m obveously a fan of the whole look… I can’t wait to see what the room looks like once the walls and cabinets are updated! It’s going to be beautiful. We’re doing our kitchen too so it will be fun to follow along! Thank you Betsy! Lots of kitchen reno’s this round! Good luck with yours, I will make sure to follow along! Thank you Susie! 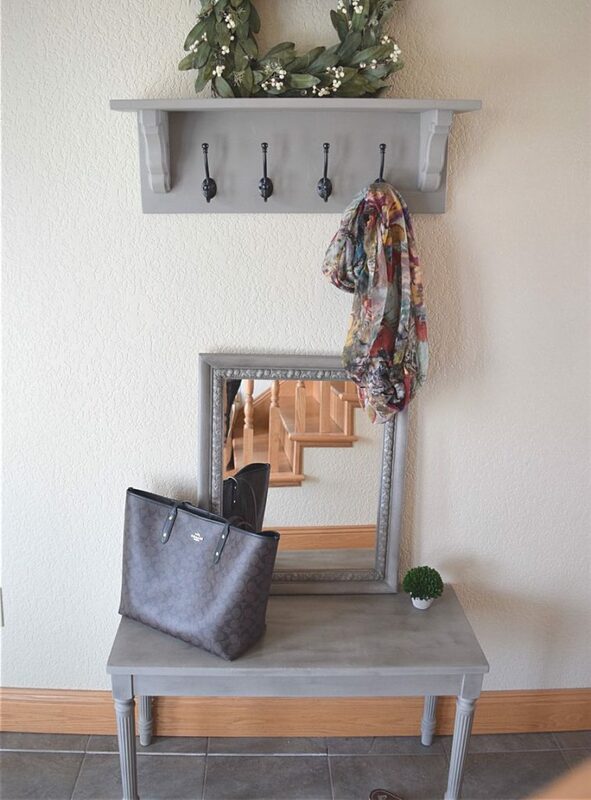 Just goes to show how easily decor can be switched up! Kristin – check out In My Own Style blog to see how she updated her counter top for very little money. Good luck with ORC! Thanks for the tip, Carla, I will have to check it out! 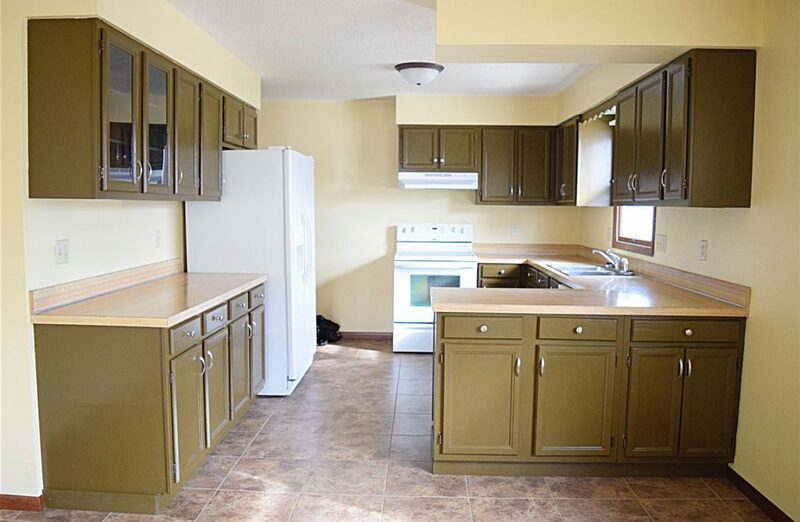 Your kitchen has so much potential! I’m looking forward to seeing it! I am mid a kitchen reno right now so I am excited to watch yours! Whoohoo for kitchen renos! Good luck with yours Morgan! Your plan looks amazing!! Good for you for taking on a kitchen – I can’t wait to follow along! The scalloped trim is seriously a trend I hope never returns. Looking forward to seeing the progress, ladies! I know right Brittany…it came off very easily tho! #nomorescallopedtrim! Good luck Kristen! 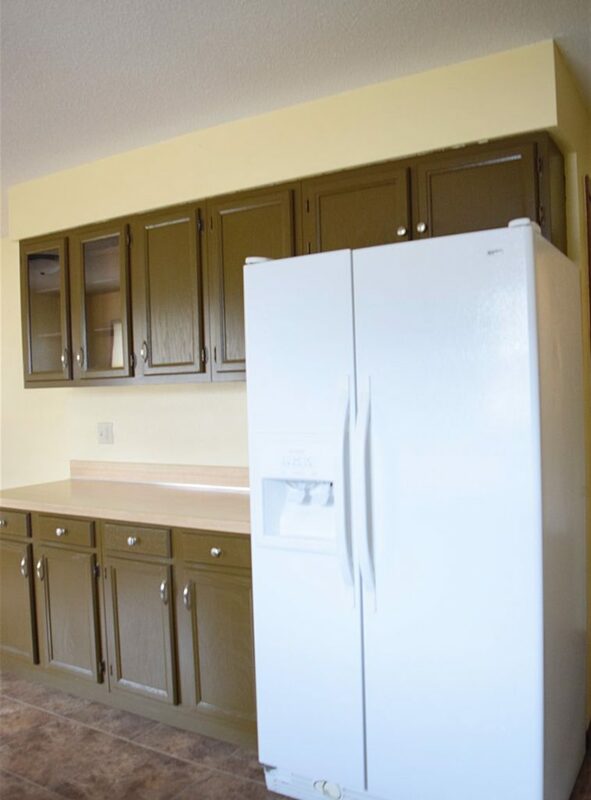 Can’t wait to watch the progress… painting those cabinets will be so worth it! I love your mood board Kristen! We are doing our kitchen as well, and I am exciting to share the journey with you! Looking forward to following your progress! Yay for kitchen makeovers!! Good luck with yours Maureen! I’ll be following you as well! Good luck! I can’t wait to see how it turns out since we will hopefully be tackling a similar makeover of our kitchen later this year! Your mood board is fantastic! Thank you Danielle! Good luck with your own kitchen makeover! They are time-consuming but well worth it! I know you are going to love your makeover! When it gets tough keep telling yourself that! Good luck! I can’t wait to follow along! I am participating for the fist time, making over my home office! You have great taste and love your inspiration board. Thank you Holly! This is our first time for this challenge too! Good luck with your office makeover! I love your mood board and I’m in awe of your design choices. They are beautiful. I can’t wait to see this all come together. I love that light fixture and dough bowl. Thank you so much Sue! We are so excited for our new and improved kitchen! I am so impressed with anyone tackling a kitchen in this short time frame! Can’t wait to see how it turns out! So exciting. Added to my Pinterest queue. Thanks for sharing at the To Grandma’s House We Go Link Party. Love your design board! Excited to follow along! I’m always so impressed with anyone who takes on a kitchen in 6 short weeks. Loving your mood board and can’t wait to follow along! Thank you Sarah! Yea, we have a lot of work to do! But in a way I’m glad we have a budget and will have to do certain aspects of the kitchen (the counters) in stages. Hi! I’m one of the co-hosts from the Welcome Home Wednesdays Link Up. I am in love with the farm house look. My hubby & I are planning our new house around the farm house style and I can’t wait to decorate. I always love finding inspiration in other’s styles and blog posts. This definitely is the style i’m thinking about. I love that mug rack! Thank you for sharing! Thank you Leslie! I definitely love the farmhouse style too, good luck with your new house! Decorating a new place gives you a new look at your home decor, there are just so many possibilities! Your mood board is lovely and I know your kitchen will turn out lovely. You’ve got a lot of work to do with those cupboards and painting. I’m looking forward to seeing this progress and the end result! Ugh, painting cabinets takes so long! Luckily I have a lot of help! Thank you for following along Carol! Thank you Michelle! It’s been a lot of work, but the results will be so worth it! 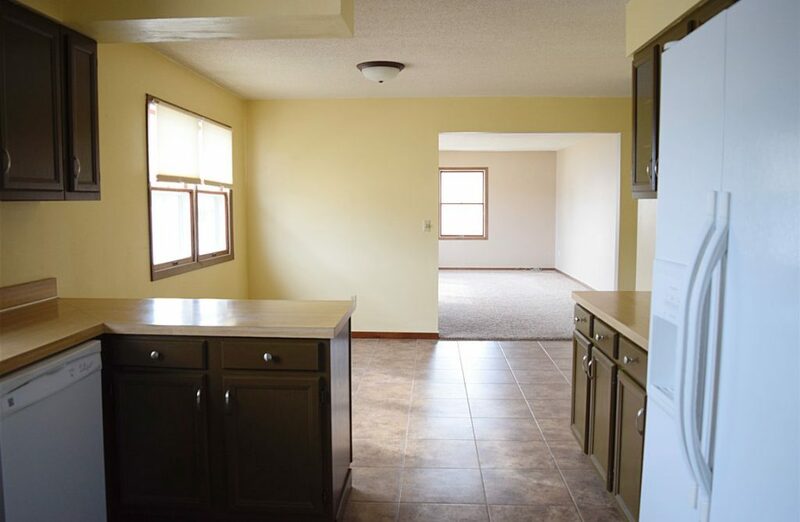 Super excited to see what you do with this kitchen! It is going to be spectacular. Thanks for sharing your before with us at Merry Monday this week! This is going to be an amazing transformation, I can’t wait to see it come together! Thank you Roxanne! Will be so nice when it’s done! Thank you for following along Judith! The 6 weeks will surely fly by! 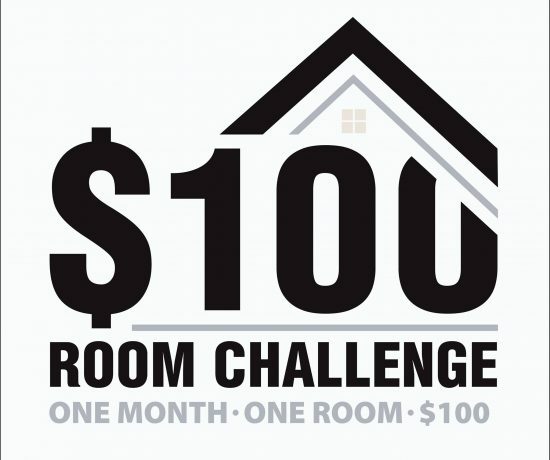 I love these one room challenges and can’t wait to see what you do with your kitchen. Thank you Erlene! Lots of work, but well worth it! I know your kitchen will look great because I saw your coffee bar! I like your paint colors. Everything will look so much lighter and brighter. I’m working on my kitchen, too. I picked a smaller project I thought might (in my case!) be doable. Organizing. . . not as interesting, but I am hoping when I’m done, I’ll like my kitchen a lot better than I do now! Organizing is still something that absolutely needs to be done! A kitchen is a big project, but we have a strict budget and can’t re-do absolutely everything at once. In a way I’m glad of that! Oh thanks so much! We do have pretty good space with the eat in dining room too! So glad you liked our plan! 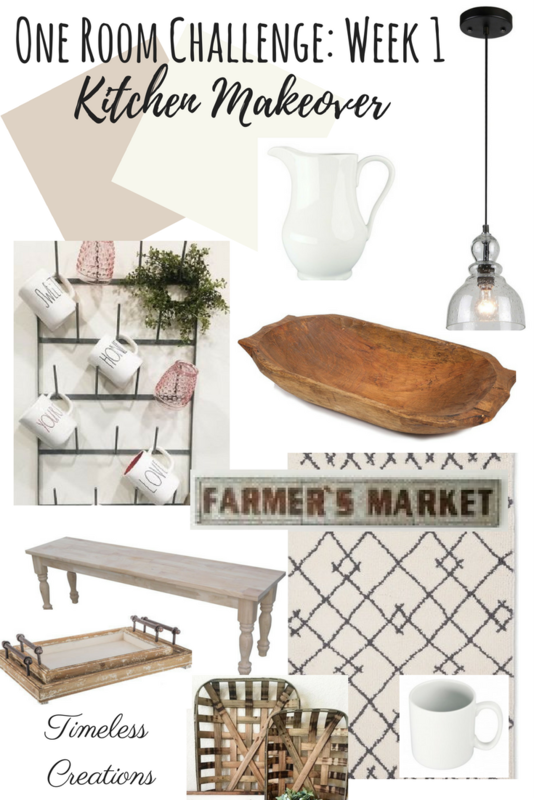 Love the mood board it definitely screams modern, country farmhouse! Sometimes not doing an entire overhaul all at once actually gives you a better result. It allows you to think about what you really want and make a timelessly designed space. Excited to see what you come up with! I definitely agree! I have debated on what the countertop should be, so now I’m glad we are waiting for that. Can’t wait for the final result to be here! I’m attempting my kitchen as well and also not giving it a entire overhaul since I previously did a little updating. But still a kitchen seems like so much work. Good luck to you and excited to see the outcome! We painted our kitchen cupboards in our last house. It was a lot of work! You have a great design board and I can’t wait to see how this turns out. Loving your design board. Painting cupboards make such a huge impact! looking forward to seeing it unfold. Love this and thank you so much for taking the time to share it with us at Funtastic Friday. Your mood board shows great things to come. Can’t wait to see the after photos. 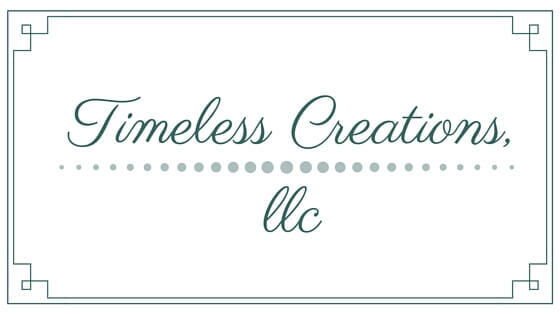 Thank you for sharing at the Snickerdoodle Create~Bake~Make link party! I love the mood board especially the rug! Thank you Amy! I love the rug too! !